Foreword. Part I: Damage in Composites. The stress intensity factors and interaction between cylindrical cracks in fiber-matrix composites (S. Close, H.M. Zbib). A computational finite element analysis for predicting the effects of environmental degradation on life in metal matrix composites (J.W. Foulk, K.L.E. Helms, D.H. Allen). Two-scale viscoplastic and damage analysis of a metal matrix composite (S. Kruch, J.L. Chaboche, T. Pottier). Damage modeling of metal matrix composite laminates with cracked oxide surface layers (X. Ma, D.C. Lagoudas). Elasto-plastic stress and strain concentration tensors for damaged fibrous composites (G.Z. Voyiadjis, T. Park). A damage cyclic plasticity model for metal matrix composites (G.Z. Voyiadjis, G. Thiagarajan). Stress failure criterion for laminated composites (H.-Y. Yeh, A.K. Feng). Part II: Interfacial Debonding in Composites. An interfacial damage model for titanium matrix composites (J. Aboudi, C.T. Herakovich). Damage mechanics of interfacial media: basic aspects, identification and application to delamination (O. Allix, P. Ladevèze). An approximate representation of fiber-matrix debonding in nonperiodic metal matrix composites (C.J. Lissenden). The evolution of debonding at the interface of a two-phase composite (N.J. Mattei). The effect of fiber architecture on the inelastic response of metal matrix composites with interfacial and fiber damage (A. Sankurathri, S. Baxter, M.-J. Pindera). A hybrid damage mechanics of progressive partial debonding in a class of brittle-matrix composites (Y.H. Zhao, J. Li, G.J. Weng). Author index. Written by leading authorities in the field of damage and micromechanics of composites, this book deals mainly with the damage impaired in composites due to different types of loading. 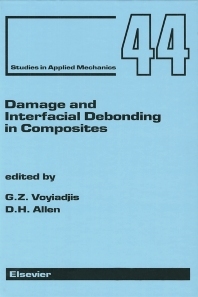 It examines the different types of damage in composites in the fiber, matrix, debonding and delamination. It also reviews the theoretical characterization of damage, its experimental determination as well as the numerical simulation of damage.